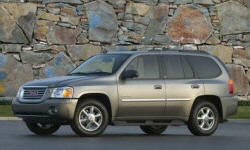 GMC Envoy Pros and Cons | Page 1 of 1 | Why Not This Car? What drives people to buy (or not buy) a certain car? 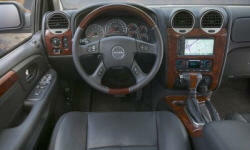 TrueDelta's members share GMC Envoy pros and cons based on their real-world driving experiences. In a 3-year-old Envoy, there were intermittent electrical issues, and power window/lock controls were breaking. Replacing a power window control required a GM dealership to "program" the switch to work with a specific vehicle (for a $130 programming fee). "Stadium" seating in the third row makes it more comfortable for older children. With the rear seats down i could fit all of my childs items (including stroller) as well as groceries, and personal items needed for regular matinence of the vehicle. Great space to move furniture also. I have spent over $2000.00 in PARTS and did the repairs myself! It has 73K miles and I have had it since 17K miles. I will NEVER buy another GM due to this one. Factory says, "OUT of warranty..."
I like the fact that after nine years of ownership, it still feels fresh and current, and does not appear that I am driving a nine year old car.